Former Ku Klux Klan leader David Duke on Monday defended Rep. Ilhan Omar's (D., Minn.) tweets decrying AIPAC and what she suggested was the pro-Israel organization's improper influence on Republican lawmakers. "So, let us get this straight. It is ‘Anti-Semitism' to point out that the most powerful political moneybags in American politics are Zionists who put another nation's interest (israel's) over that of America ??????" Duke wrote in response to a tweet from Nikki Haley. The former U.S. ambassador to the United Nations had responded to Omar's tweets from Sunday with condemnation. 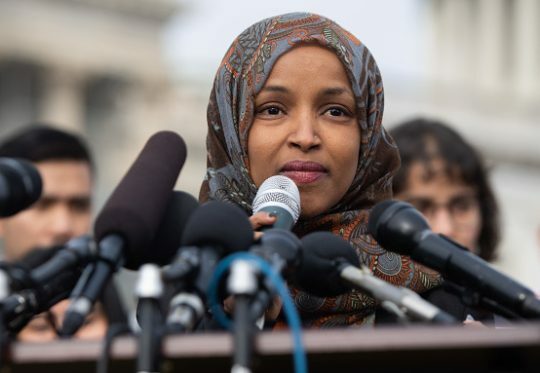 Omar attracted controversy when on Sunday she suggested that Republican support for Israel is driven by funding from the American-Israel Public Affairs Committee (AIPAC), an organization that does not directly donate to candidates. Omar retweeted left-wing journalist Glenn Greenwald's condemnatory comments regarding how Rep. Kevin McCarthy (R., Calif.) criticized the congresswoman for anti-Israel stances. Omar wrote, "It's all about the Benjamins baby," a reference to $100 bills. When Forward opinion editor Batya Ungar-Sargon said she'd love to know who is "paying American politicians to be pro-Israel," Omar responded, "AIPAC!" Duke, who served as grand wizard from 1974 to 1979, has an extensive history of racist rhetoric and of promulgating anti-Semitic conspiracy theories. On Saturday, prior to Omar's tweets, Duke posted pictures of Ivanka Trump, Jared Kushner, and their family, who are Jewish, on Twitter, with the caption "Please, accept me… screw the Christians, Israel first!" He has endorsed 2020 presidential hopeful Rep. Tulsi Gabbard (D., Hawaii) with the statement: "Tulsi Gabbard for President. Finally a candidate who will actually put America First rather than Israel First!" Gabbard rejected the endorsement. Omar's comments from Sunday attracted criticism from many Democrats, including Reps. Max Rose (D., N.Y.), Sean Patrick Maloney (N.Y.), Tom Suozzi (N.Y.), Josh Gottheimer (N.J.) and Donna Shalala (Fla.). Rose, who is Jewish, tweeted out a statement calling Omar's words "hateful and offensive." This entry was posted in Issues and tagged Anti-Semitism, Ilhan Omar, Israel. Bookmark the permalink.